The ModeShape specification for programmatically creating JCR NodeDefinitions. 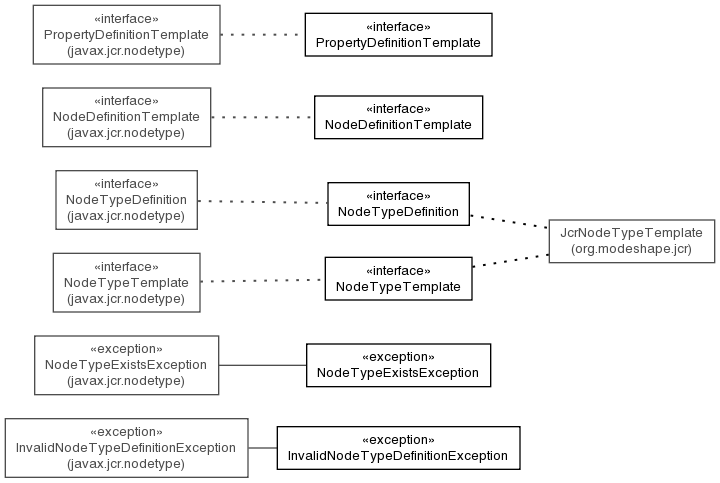 NodeTypeExistsException An exception that captures the error condition that a referenced node type already exists. The ModeShape specification for programmatically creating JCR NodeDefinitions. To use, simply obtain the JCR NodeTypeManager from the workspace and cast to a JcrNodeTypeManager. That object can then be used to create new node definition templates, node type templates, and property definition templates, and to then register the new node types. This design is patterned after the similar funcationality in the JCR 2.0 Public Final Draft (PFD), and will eventually be migrated to implement the specification when ModeShape supports the final JCR 2.0 final specification.